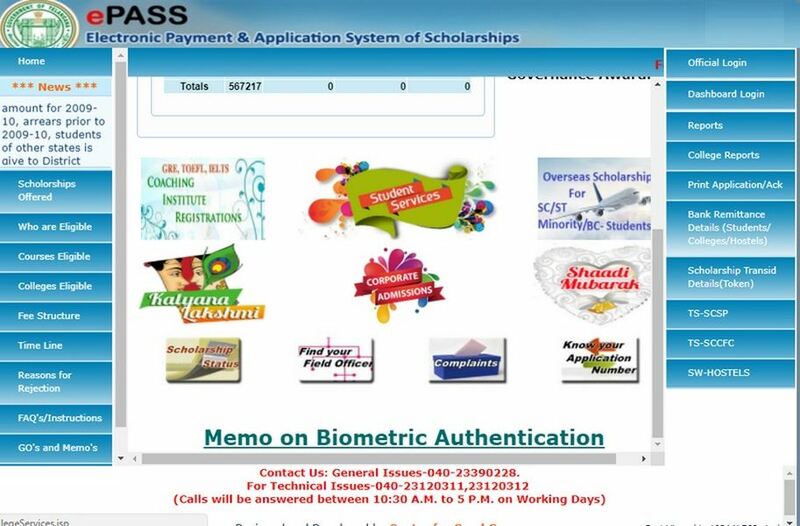 ePASS stands for Electronic Payment and Application System of Scholarships. It goes back to 1948 when India first started to provide scholarships to Post‐Matriculation and Post‐Secondary’s students. The underprivileged categories were also included in the program. Nowadays, Epass is mainly funded by the government. The governments of Telangana and Andhra Pradesh manage the EPass. The applicants are grouped into two categories: the pre-matric and post-matric students. To receive the scholarship, the candidates have to fulfill the eligibility criteria. Since Telangana bifurcated, the program also got divided. One is known as Telangana ePass and another Andhra ePass. We have described the official rules of the whole application and selection process. The Procedure of Registration to Apply for Epass 2017- 2018 is explained below. 5 What Courses are eligible for Epass Scholarship? You can quickly check the scholarship status using the form no or the website. The link for finding the epass application status is http://epasswebsite.cgg.gov.in/. According to the AP norms for 2017 and 2018, BC, SC, and ST students still have time to apply for the scholarship. They can click on the official website for the same. Furthermore, the TS ePASS scholarship status or TS ePASS status can be verified by only using the application number. The candidates need to access their official website at telanganaepas.cgg.gov.in. Here they must fill in the previously mentioned information. So they can obtain the TS scholarship status. You must check the epass status AP (where AP Epass stands for Andhra Pradesh ePASS), at AP Epass Status 2017-18 @ https://epass.apcfss.in/ (online application). AP Epass is a scholarship that can serve both fresh and new entry student, but also those who need a renewal. Telangana ePASS status for 2017 and 2018 can be found at www.telanganaepass.cgg.gov.in. The candidate should click on “Scholarship Status.” Then he or she will be directed to complete the same information as mentioned above. (1) a photograph that should have the same size as the one from the passport. (3) the first page of the Bank Pass Book with information on the name the of student, bank account number, and IFSC bank code. (4) the study certificate with the last seven years of study. (5) a type of Common Entrance Test (such as Eamcet, PGECET). The form for application printing includes the SSC examination number, academic year, year of the pass, date of birth, and the SSC pass type. All this information is contained within a scholarship form. Only students whose parental revenue is no more than 2 Lakhs qualify for Epass scholarships. Another fundamental condition is that they should attend at least 75% of the courses. The students whose family earns more than 2 Lakhs are not eligible for the scheme. 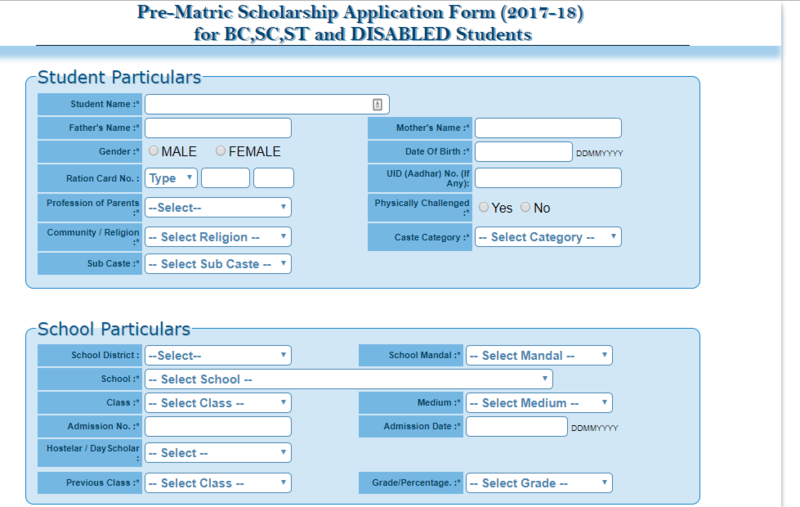 Also, those that are not in SC, ST, BC, EBC, and DW (Disabled) categories, do not fulfill the criteria of the scholarship. Also, those who want to enroll in online or part time courses/distant mode, again are not eligible. So are the students sponsored by other institutions or from other sources? The EBC students from Intermediate courses or similar courses are also not eligible. The Telangana Epass governmental Scholarships are subject to a series of eligibility criteria, as stipulated in the official documents of Telangana Epass Scholarships Fresh and Renewal Procedure, Epass renewal 2016-17 last date. (1) The total revenue of the family members of the applicant and the income of the candidate himself should be no more than 1 lakh yearly. An exception applies for those who are part of SC and ST communities who may have a family income of 2 lakhs. (2) about the age criteria, the limitation has to be set according to the level of study (30- 34 years for post graduates; 25- 29 years for graduate; 20- 24 years for intermediate). (3) the interval between graduated and the current course should be at most two years. What Courses are eligible for Epass Scholarship? (1) The professional courses, where we include the degree and medicine, technology, engineering, agriculture, veterinary sciences, business finance, management, administration and computer applications, etc. (2) The highest degree in specialized courses, such as Ph.D. and post-doctoral programs, or other graduate and certificate levels, and also post graduate courses. List of Colleges eligible for Epass Scholarship? The eligible colleges are all the government accredited Post Matric Colleges. The Departments of Higher Education, the Health Medical, and Family Welfare, the Employment, and Training, are examples of Administrative Departments announcing the eligible colleges, information that has to arrive at the Commissioner of Social Welfare. Students shall be rejected if they come from an inappropriate caste from an income perspective. If they miss classes or courses, do not send all the necessary documentation (such as income certificates). When they were subject to sanctions before renewal if they do not attend the courses etc. Candidates can apply for the Epass scholarship only once in a year. It is necessary that the application is made no sooner that one month after the admission date. The study certificates, also known as bonafide certificates, are to be issued at the time of submission. The Field Officer is the one in charge with checking the file of the candidates. The recommendations can be sent a week after this verification made by the Field Officer. Further on, there are some requirements that have to be accomplished for a successful registration. For instance, students have to own a particular student card, a caste certificate, and income certificate, a bank account, a mobile phone number for finalizing the application (as a password is sent through SMS), a bonafide certificate, the common entrance test. Also, in case they are students of intermediate education level, the online admission form from issued by the Board of Intermediate Education has to be filled in. Finally, the applications have to be registered and confirmed to the student. When applying for the Telangana scholarship, each candidate is assigned an application number. However, if someone does not remember this name, he or she should follow a particular procedure for recovering it. The first step is to enter the portal. Then, the candidate will have to search for a highlighted scrollbar, and move it to the bottom of the web page, tThis allows an option of displaying the application number to appear. A click on this option allows for another web page to show up. Here, the applicant has to complete certain information details, such as the SSC Hall Ticket Number or the Academic year of your study. Finally, the search button links us to the display of the Epass Application Number. (1) Reimbursement of Tuition Fee (RTF) on post matric courses once these are authorized by the Board of the university two times per year. (2) Maintenance charges on a monthly basis. According to Epass data on backward class and disabled welfare, the maintenance fees for years 2011- 2012 covered 962 hostlers, 442 students managed hostels, and 429-day scholars, in case of engineering, medicine, CPL, MCA, and MBA courses. Ph.D. candidates who receive the scholarship have been in the category of hostlers (682), students managed hostels (442), and day scholars (429). Finally, those owning a degree also qualified for Epass, as well as students from Polytechnic, IT, and vocational areas. Telangana and AP Epass scholarships need to serve students from ten districts. One relevant category of such scholarships are the Hyderabad types of scholarships that are also linked to the introduction of GPS and Wifi City applications. The Total Survey of Telangana was useful for gathering feedback on adding technological functions through applications. Students qualifying for Telangana scholarship are accommodated in Karimnagar, Hydebarad, Nalgonda, and Warangal. The new website created for TS scholarships (at TS ePASS home page telanganaeepass.cgg.gov.in) is very similar to the previous site version, with small changes incurred only. According to the last ePASS Releases Abstract Report, the scholarships for minorities have been provided to no less than 124.429 students in the academic year 2016- 2017. (2) Candidates have to gather all the necessary documentation at the Welfare Department in Hyderabad. (7) any applications that do not contain all the required documentation are eliminated from the scholarship competition in the first stage of selection process. The selection procedure involves certain phases that have to be followed. At the beginning, the scholarship programme is advertised in universities and in the online media, such as the Epass website. There are two main campaigns here, one takes place August and September, respectively the other in January and February. Then, the online portal for application is opened. Candidates can apply in two rounds: during August and September, and between January and February. Also, the programme contains criteria for gender anti-discrimination policies, as women should represent 33% from the total selected candidates. However, this might not apply when there are not enough female applications. The portal where applications must be uploaded is http://www.apsocialwelfare.cgg.gov.in. The documentation be uploaded by the candidates should contain personal data (name, birth date, certificates of revenue, the Epass identification number, the certificate of residence, the score obtained at TOEFL, IELTS, GMAT or GRE exam, an official document with all the marks obtained at graduate level or post graduate level, or all the results from exams if still a student, the proof of admission at the foreign university (letter of acceptance), the bank pass book, and a photo. The scholarship is provided in two main installments: Rs.5.00 lakhs when the student presents the immigration card, respectively the other Rs.5.00 lakhs when the results or outcomes from the first semester can be evaluated. Additional Rs.10.00 lakhs are offered to selected candidates for accommodation and food expenditures. Further on, candidates are able to lend Rs.5.00 lakhs from a Nationalized Bank with at advantageous interest rate. More than that, students are allowed to earn more by working as teaching assistants or researchers within the university. The journey costs shall be reimbursed for low-cost companies only, as well as the expenses related to visa release. Of course, the student has to present the proper documentation to prove these expenses: bills, receipts, reservations, tickets etc. Set up by Epass system, with the implication of Andhra Pradesh’s Welfare Department, the pre matric scholarships can be obtained by eligible candidates, who send online applications. Those who receive the scholarship have the possibility to withdraw funds either using an ATM, either through fingerprint authentication online system provided by Micro ATM and UIDA technology. passing all exams for an entire year. This is really in-depth and detailed step by step guide to epass scholarships. You have shared all the points in a single post. May I know when do I get this year’s scholarship to my bank account? I still didn’t got the scholarship of the year 2016-2017, whenever I check the status it says pending at verification office. Please tell me what to do now?